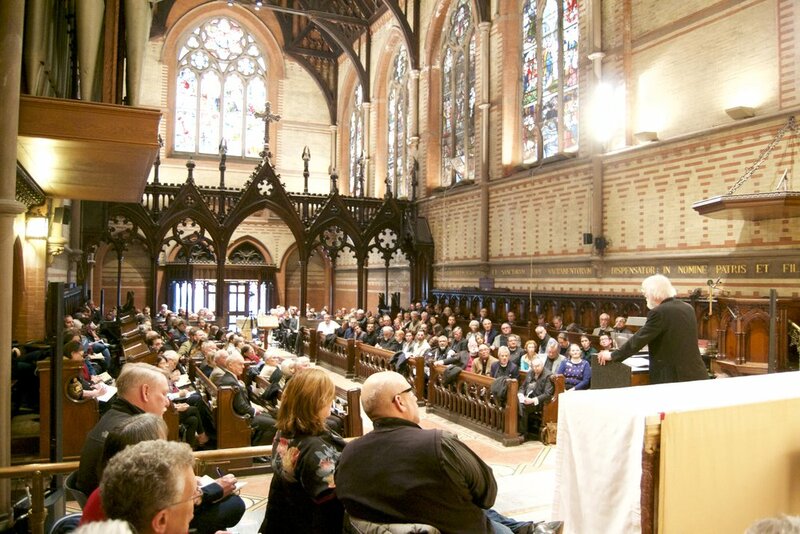 Williams delivers the 2019 Paddock Lectures in the Chapel of the Good Shepherd. Williams took us through a lightning round of theologians, philosophers, and literary influences. From Irenaeus to Angela West, T.S. Eliot to Bonhoeffer, we reviewed how these thinkers helped Williams form his own theology, how he came to understand “a way of being in a world shaped by the incarnation.” He brought us to a theology which purges our “self-serving mythologies” so that we can find faith, hope, and love. When we are converted, we see a world which looks different. Social witness is not the only responsibility which we have as members of the living Body of Christ. We also have a responsibility to resist the pressure to stay busy. As a seminarian, that is a message that I can fully embrace! We have lost some of the gifts of apophaticism. We hunger for silence and stillness, especially in a world where overstimulation is the standard. Busyness and noisiness are not gifts; we don’t have to stay busy and have all the answers. There is a special joy in letting go of the need to “know” the answers; a special joy in shutting up and giving God the space to be God for us. It is in that stillness that we re-energize in order to do the work of social witness and speaking to power. Rowan Williams brings us 45 years of being Christian, and 45 years of sane exploration of how we make meaning. He gives us an invitation to explore creation and the Creator in the face of our rapidly changing world. From the past 45 years, he brings a little peace and stillness to help us face today.